Sunday Scribblings is offering a smorgasbord prompt this week - a chance to write to any of the 101(!) prompts used to date. There were loads of great ones to choose from, but as soon as I saw "hotel stories" I knew I'd found my winner. I could write a novel on hotel horror stories. There was the Hotel Gambetta in Dieppe, France, (which I'm sure must translate to "Bates Hotel" in French). We'd just missed, literally, by seconds, the very last room at a perfectly respectable hotel down the block. The woman behind the desk actually apologized profusely when she sent us to the Gambetta. Once we got there, we understood why. We slept with the door locked and dead-bolted all night, and then abandoned the complimentary breakfast to get away as quickly as possible the following morning, prefering to return to the first hotel and pay for breakfast instead. Then there was the hotel in a certain northern Israeli city many years ago where the staff was lovely, really friendly and helpful, albeit a bit surprised to have actual guests as opposed to the long-stay Romanian construction workers that were filling up the rest of the rooms, when they weren't busy filling up the lounge drinking bottle after bottle of cheap booze. Oh, and the bathrooms were down the hall, too. There was the Hotel Metropol in Ankara, Turkey, where the heat only worked a few hours a day, in January, with temperatures well below freezing. I was there for weeks months years decades during my first project in Turkey and got to know the staff reasonably well, or as well as I could considering that they didn't speak any English and I didn't speak Turkish. I'd spend most of the evening drinking tea in the hotel restaurant to heat myself up from the inside, then go upstairs and draw the hottest bath I could stand and would then literally parboil myself until I was nearly falling asleep in the tub. At that point I was usually warm and groggy enough to stumble into bed and fall straight asleep. If I decided to read for a while or got a phone call though, my body temperature would plummet again and I'd be too cold to fall asleep without another bath. Oh, and the place stunk so badly of cigarette smoke that even clothes I'd never worn came home smelling like they'd been barbecued! The hotel that stands out the most for sheer incompetence though has to have been a little inn I used to stay in when I went to Surrey (England) on business. My company's regional headquarters are for some obscure historical reason located outside of a fairly small village several miles past the middle of nowhere. The only lodging option was the rather grandly named Inn on the Lake, known locally as the Pub on the Pond. The Inn was everything you'd want in a quaint country inn - fairly quiet, period (facsimile) furniture, an attached pub that served halfway decent food... What it was not, however, was a business hotel. I once received a critically important fax printed on pink paper. Ok, pink, fine, whatever, but that paper was from their pile of SCRAP paper! The one side was my Very Important Document, and the other contained random pages from their employee handbook - things like the importance of smiling at the guests and cleaning the toilets on the proper schedule! Another time I stopped by the desk to check for messages and was told I had none. I happened to notice a message for a "Mr. Robbins" (my name is Robin, remember) in Room 11 from a Mr. B_ H_. I told the clerk that I believed the message was in fact for me. "Oh no ma'am, that is for Mr. Robbins." I then had to explain that unless my room had a ghost, I was in fact the only occupant of Room 11, and furthermore I was fairly confident that I was the only person Mr. B_ H_ knew within 600 miles of that hotel. 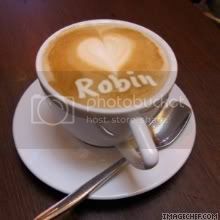 Perhaps the message was meant for me, ROBIN, rather than some fictional Mr. Robbins? (They never did concede that one, but I went ahead and called him back anyway - from the pay phone in the hall, because in those pre-cellphone days my British room phone would not accept my British Telecom phone card!). Then of course there were my wakeup calls, which would only occasionally come during the same hour I'd requested them. The Inn was a nightmare for a traveler in need of a basic level of business services, but it was worth its weight in gold as future blog fodder. I can't even tell you how glad I am that we stayed here for two nights this week instead. Okay, you're making me glad I don't travel as much as I'd like! Wow!!! What a place. I would love to visit... and stay... if you stayed with me to keep me safe! You reminded me of a hotel where I spent my first night in Israel, possibly somewhere near Tel Aviv I forget now, it was 16 years ago! The room had double doors which opened onto a none existent balcony and didn't close properly. It was blowing a gale that night and we didn't get a wink of sleep as the doors rattled in the wind. The whole place was pretty unwelcoming and didn't make a good first impression on a group of 16 year olds! The rest of the holiday got better although the weather didn't. Anyway, you can always rely on the English for rustic charm, or utter incompetence depending on how you chose to look at it! Who knew awful hotel experience would prove so valuable for filling blog inches! wow, you've had some awful experiences! I have many hotel stories, but they sure don't top these! great post. Have you ever seen Faulty Towers? If not, you should check it out. The worst hotel keeper in the world, and it's all true! PS Before going to Florence this fall Jay and I were seriously considering Barcelona. I wasn't sure I'd ever be able to order a meal with a straight face though - how could I have ever made it through without a "he's from Barcelona" crack sneaking out? oh, goodness, and this makes me want to travel because.....??? yikes, you're a good sport....yep, some good stories here! I am wondering why I didn't choose to write about hotel horrors instead of the lovely Quitandinha! Our prize horror was in France just over the border from Switzerland. We'd been searching for hours for one with a vacancy, finally found one with a double bed an four single beds (all in one room with no plumbing, toilet down the hall, not a lavatory in sight). Then three of the beds collapsed with a leg broken off of each under our light-weight selves. We had to go forage in the yard for bricks to prop up the beds. True horrors! It reminded me of a few of my own hotel horros. Someday I will write about that. Hotels are wonderful inspirations for horror stories, no matter the country! And, they don't have to be haunted, either, do they (lol). Around here, we say that "experience" is what you get when you didn't get what you wanted. You had an "experience." So, sweet friend, can I convince you to write a story for my Scared Silly contest? I know the prize is only $30 US, but a buck is a buck. I live a short hop across the water from Dieppe and often go across for lunch. I'll see if your hotel is there next time I visit. The Inn on the Lake is still going strong - it's a regular stop off point for me on my way to London. Sounds like you have stayed in some doozies. I've only ever left a hotel early (because it was dirty) once, and I've never actually felt in danger. We did pick a hotel once for its proximity to Galveston, yet not actually on the island. Better price, we thought--and it was, but it was also smack dab in the middle of an oil refining sector. Pew! well i know each one was probably not nearly as funny while you were living thru it... but i had a good laugh!! Hey...check out my blog...got a package from you today : ) LOVE IT!!!!! Oh my gosh, you've really had some hotel experiences! I've had cockroaches in my hotel room in Bermuda more than once, but that's about it. Your travelling sounds very exciting- do you miss it? Yes definately a nightmare!! Especially the cigarette smoke.. I wouldn't be able to sleep for sure! I had an experience where someone urinated in the middle of the bed.The bedspread was dry but when we pulled it back we found wet sheets, we bolted immediately! Nothing scarier than hotels! I enjoyed reading of your experiences and love the phrase 'blog fodder'! Sounds like a whole bunch of places that would make you very happy to be home. I can - exactly - picture the inn in England. So cool that you have been so many places even if they were lacking in some areas! I am such a home-body staying in 4 star hotels is starting to creep me out. Sad, I know! I should start traveling more to get over it! Dad, Can I Play Soccer On Your Phone?